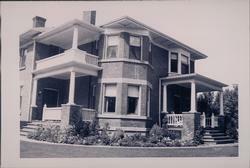 Our Story - Newcastle Funeral Home Ltd.
Newcastle Funeral Home is a historic building in Newcastle, Ontario. Originally it was the home of Mr. Thomas Montague, who was one of Newcastle's most prominent and generous citizens. Thomas Montague was born in 1845 in London, England. He passed away in 1928. Rev. Scott Howard, his wife Clara and their two children also lived in the house with Montague. Rev. Howard died in 1939 in his 83rd year. Mrs. Howard stayed in the home until prior to her death in 1952. Shortly after, it became the South Haven Rest Home, which eventually went into bankruptcy, leaving the once beautiful home empty for a number of years. In the fall of 1995, Carl Good and his wife Joyce Kufta purchased the property. They began an extensive restoration of the home and opened as Newcastle Funeral Home in 1996. Originally from Wilmot Township, a small farming community near Kitchener/Waterloo, Carl Good brings over 30 years of funeral service experience to the families of Newcastle and the surrounding communities. His wife Joyce Kufta is also from a funeral service background, with more than 25 years experience in funeral home administration. In 2012, Carl and Joyce sold the business to Trevor Charbonneau. Trevor is a licensed funeral director who is originally from a small town in Northern Ontario. Trevor started his career as a funeral director at Rosar-Morrison Funeral Home in Toronto in the year 2000. He eventually became the Assistant Manager there. In 2006, he was promoted to Manager of Jerrett Funeral Home in Scarborough. Trevor continues on with the same level of dedication and service that Newcastle has come to know from Carl and Joyce. Along with his wife Rebecca, and children Isabella and Evan, he looks forward to serving the community for many years to come. It has been said that an individual adult may only need to arrange a funeral once every ten or more years. It therefore stands to reason that the expenses involved in funeral services and merchandise may not be familiar to us. The information in this web site is presented to you to foster a clearer understanding of the costs associated with the services we provide. By law, every funeral home is required to provide you with an up-to-date price list which clearly identifies the costs associated with the various services they provide. This list should also identify, by manufacturer and model name or number, the caskets, urns, vaults, and other merchandise they offer so that you may compare prices in an educated manner. You should be cautious of any price list that does not clearly outline costs and identify the merchandise offered. When arranging a funeral, there are basically three areas of expense to be considered: the first is the Funeral Service Charge. This refers specifically to the work we do and the facilities and vehicles we provide. The second expense to be considered is the Merchandise Cost, which refers to the casket or alternate container, burial vault, cremation urn and various other items.When comparing costs of merchandise it is important to note the manufacturer, model number or name and the material and craftsmanship used in the construction. The third area of expense includes the outside costs that the funeral home may pay on your behalf and include on your funeral account. These cash disbursements include such items as cemetery or crematorium costs, newspaper notices, clergy offerings and coroner's fees. We can give you a close estimate of these figures, but they must be charged to you at their exact cost. Prices can vary from funeral home to funeral home, and you are well within your rights as a purchaser to expect a clear and accurate estimate of costs for the type of service you are contemplating before you make a final decision. As mentioned, all funeral homes must provide you with a price list upon request. Costs are always within your control, and of course will depend on the type of service you are requesting. We would be pleased to provide you with an accurate estimate of costs based on the type of service you are interested in. Please contact us by phone or e-mail and we will provide you with complete information, at no obligation or cost.